There are three faculties in RTA: Economic and Management, Engineering, as well as Education, Language and Design faculty. 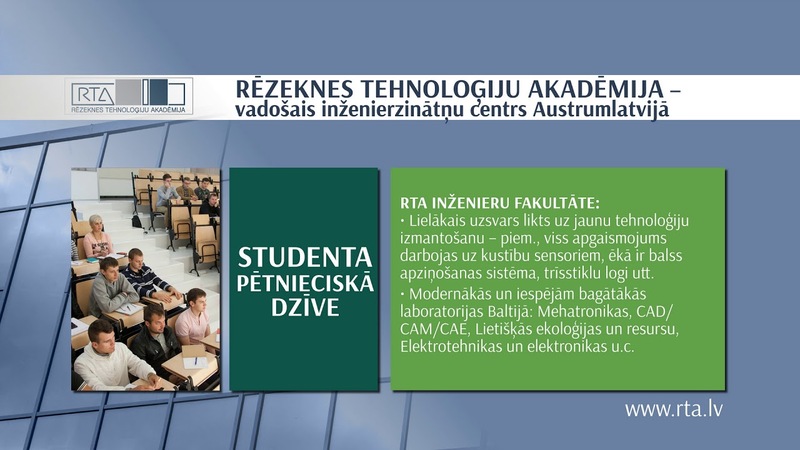 RTA faculties, Research Institute, research centres, and cooperating institutions promote the development of science and research, acquisition of new technologies, development and transfer to Latvian national economy. On 28August 1992 1stLatgalian Congress adopted a resolution in which the priority of the region and the state was organizing the educational system, including foundation of Rezekne Higher Eucation Institution, which became the commencement of RTA.A working group was established to develop concept for new higher education institution.With the support from The World Federation of Free Latvians, Ministry of Education and Science, and Rezekne municipality the project of the new institution was implemented in a relatively short time. RHEI was established on the basis of the branches of the University of Latvia and Riga Technical University.The idea of establishing the University of Latgale was supported by The Popular Front of Latvia (political organization in Latvia in late 1980s and early 1990s which led Latvia to its independence from the Soviet Union), Rezekne municipality, and the University of Latvia.On 1 September 1990 the first hundred students of LU Latgale branch started economics and philology studies in the building of Rezekne Pedagogical School located on Atbrīvošanasaleja 115.In a year Latgale branch got educational premises on Atbrīvošanasaleja 90 and serious work on recruitment of academic staff and infrastructure development was initiated. According to the decision of the Council of Ministers of the Republic of Latvia (accepted on 12 April 1993) RHEI functioned as an independent higher education institution from 1 July 1993. On 23 August 1994 the Cabinet of Ministers approved IrēnaSilineviča as the rector of RHEI.In 1999 RHEI acquired unlimited international accreditation and became an important cultural, educational and scientific centre in Latvia. By working closely with local municipalities RHEI developed country-wide projects such as the project of Rezekne Special Economic Zone.In cooperation with the Latgale Region Development Agency professors of RHEI developed the Latgale regional development plan, Rezekne region tourism development concept, and other projects. The beginnings of higher education in Rezekne date back to 1922 when the Pedagogical High School was established. In 1925 it was renamed as Rezekne State Teachers Institute. Starting with academic year 1926/1927 Rezekne State Teachers Institute implemented a five-year training program, but since 1932/1933 - six-year program.In January 1941 Rezekne State Teachers Institute was reorganized and became a higher education institution – Rezekne State Pedagogical Institute with three faculties: Physics - Maths, History, and Russian language and literature.Rezekne State Teachers Institute worked until 1944, when the building was destroyed in air strikes. After the restoration of the building Rezekne Pedagogical School was established (1947-1956).From 1957 to 1987 there was Rezekne boarding school. Pedagogical education traditions returned with the restoration of Rezekne Pedagogical School in 1987. In 1991 Rezekne Teachers Institute was established and in 1995 it was included in the RHEI. Since the very beginning of the Republic of Latvia institutions of higher education have had significant and important role in the development of Latgale region. From 1925 until 1944 there was Rezekne State Teachers Institute in Rezekne. Later, after renovation of the building, there was also Rezekne Pedagogical School (1947 - 1956), Rezekne Boarding School (1956 - 1987), and then again Rezekne Pedagogical School (1987 - 1991).Since 1991 there was Rezekne Teachers Institute. In 1995 it was included in RHEI as the faculty of Pedagogy. An independent higher education institution revived when Republic of Latvia restored its independence in 1991. In the summer 1917 ValerijaSeile organized Latgale Teachers Training Courses and 1st Latgale Teachers Congress.She was the first women in Latgale to acquire academic education. On 25 October 1920 the Ministry of Education of the Republic of Latvia organized one-year teacher training courses in Rezekne.On 1 January 1922 these courses were transformed to Rezekne Pedagogical School by the Ministry of Education. The number of students reached 147, but in August 1925 Rezekne Pedagogical ceased its activity. It was replaced by Rezekne State Teachers Institute, providing five-year training course. The goal of the Institute was to prepare teachers for primary schools, kindergartens, general educational subjects of different courses, special schools and lower level vocational schools. Mietule I. (2012). Rēzeknes Augstskola. Šuplinska I. (zin.red.) (2012). Latgales lingvoteritoriālā vārdnīca. Rēzekne: Rēzeknes Augstskola. 611.-614. lpp. Unda, V. (1998). Rēzeknes Valsts Skolotāju institūts, 1925-1944. Rēzekne: Latgales Kultūras Centra izdevniecība.